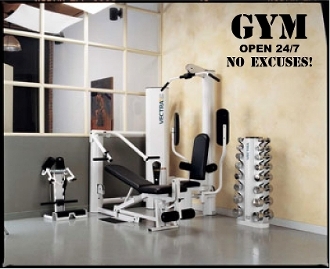 GYM OPEN 24/7 NO EXCUSES! Our Products >> GYM OPEN 24/7 NO EXCUSES! Vinyl decal measures 22"x14" or 36"x20". Made from oracal 631 matte vinyl. Thin material makes it look like it has been painted on. Goes on to flat surfaces, heavily textured walls make installation harder. When you want to remove it simply heat it up with a blow dryer and it peels off, not re-usable.